I have been to Bangkok many a times till now. My Bangkok experience is not that great due to the reason that it is the only place where I have been to for check-ups which, unfortunately have not been a very pleasant experience that I would want to remember when I look back. Nonetheless, there are some very good experiences that I could rather reflect on. Bangkok is a haven for branded items you can have in good price. But, beware of the fake items! You need to have a keen understanding in this matter in order to differentiate the fake from the genuine. Like I said, there are also some positive aspects that I could find in Bangkok. Firstly, there are some really good bookstores at Bangkok like Kinokuniya and Borders. Also there are sumptuous as well as scrumptious street food items and franchise food outlets that are only available in Bangkok. 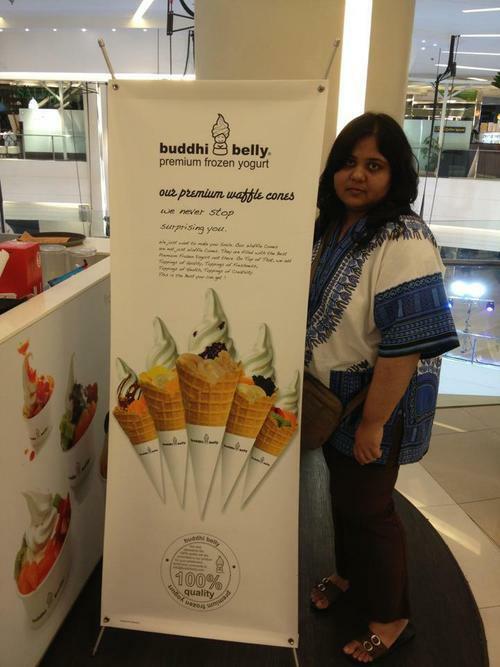 One such franchise is Buddhi Belly. 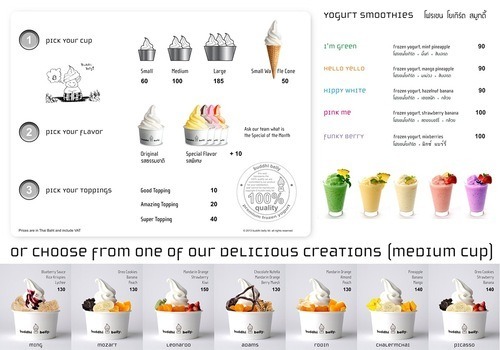 This is a frozen yogurt store that serves slightly sour taste of yogurt with prodigal amounts of fresh fruits and granola that they sprinkle on top of the light, frozen yogurt lavishly when the dessert get delivered. 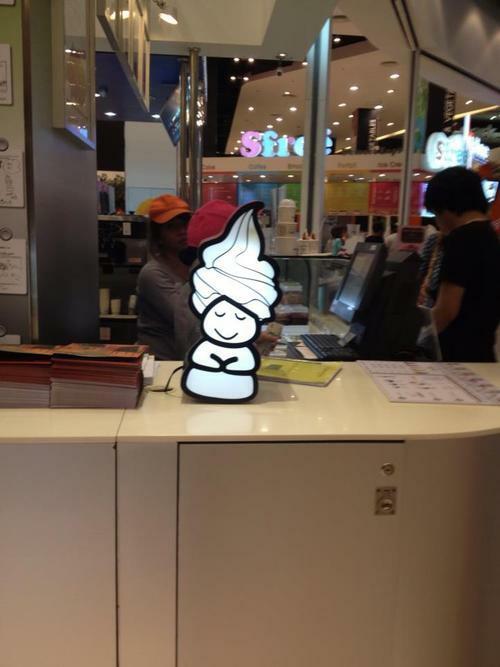 Below is the picture of the marvelous icon of the frozen yogurt store that I could not help to refrain myself from clicking the photo in the Siam Paragon shopping mall. 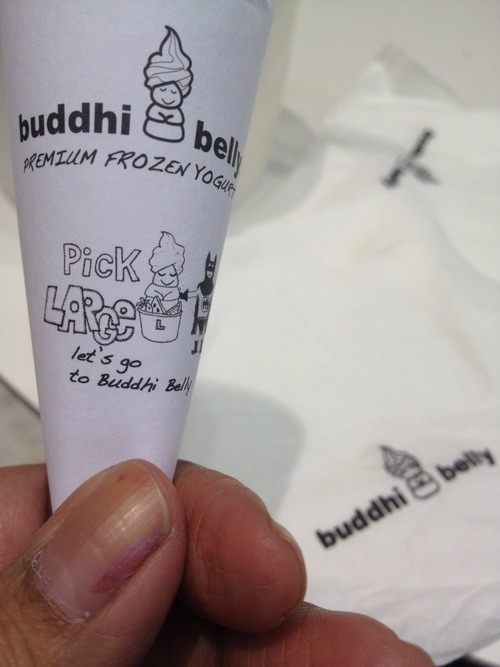 Never have I tasted any frozen yogurt as tasty as ’Buddhi Belly’! 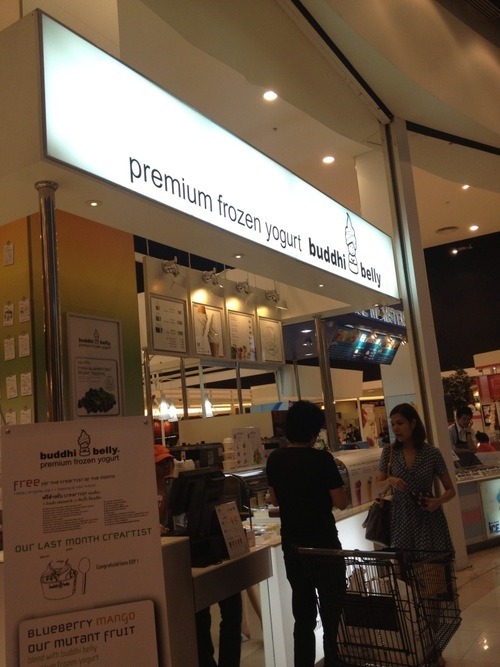 I have become such a fan of the yogurt that I asked Shelly, my travel mate to click a picture of mine with the banner of the store at Siam Paragon. I was in so love with the cute icon of the brand that I took picture of the trade character imprinted on the things that usually are supplied from the store with the delivery of the dessert (pictured above). 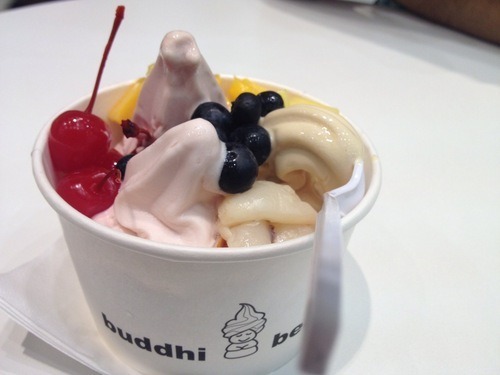 The above pictureis the dessert that I took at Siam Paragon! 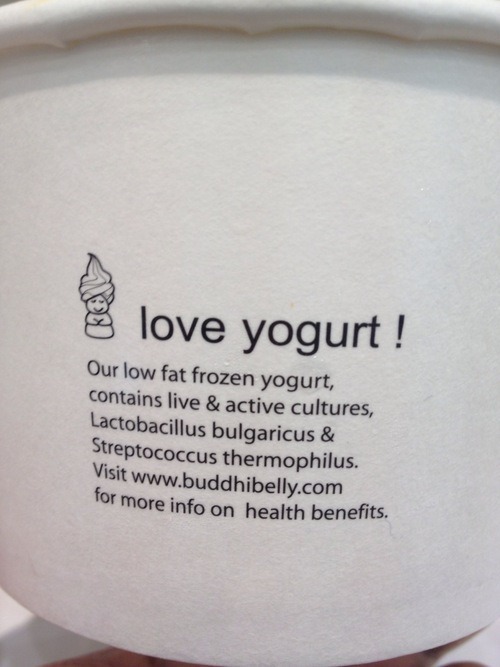 Unless you have tasted it yourself, you will never know how awesome it is! Now, I do not get any commission to spread this positive word of mouth! I really do appreciate whatever is truly good according to my opinion! If you happen to taste Buddhi Belly yourself, please do remember that ’Umini’s Itchy Feet’ suggested this ambrosia to you! Thanks for liking my web log. Yes I am using WordPress. You are absolutely right. 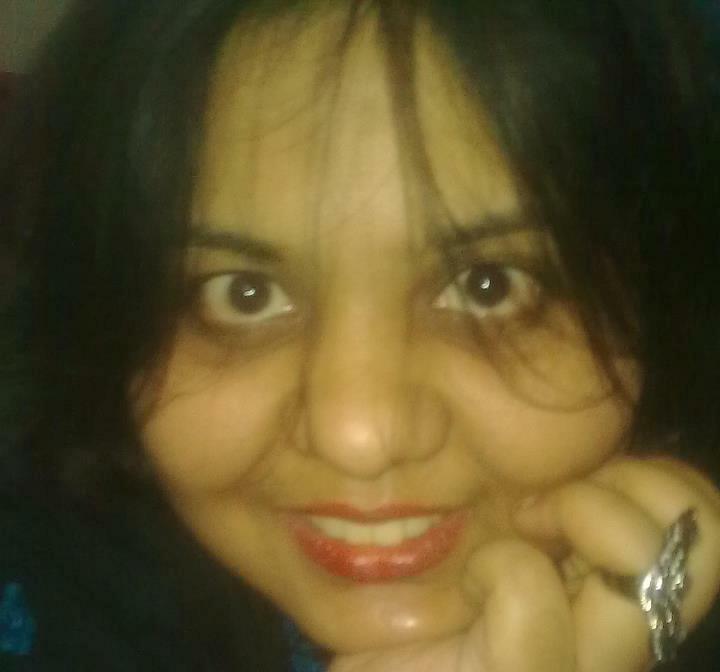 I am having a look forward on your subsequent post, I will try to get the hold of it! Thanks! Please check out the FAQ section of this blog for your answers. Hope this helps! I feel this is one of the most important info for me. And i’m satisfied studying your article. Hi! Thanks! I am yet to provide any mail subscriptions or e-newsletter service. Hope you understand. I love reading through a write-up that can make people think.